On 14 March 2015, the march called “Europe Stands with Tibet” assembled in Paris supporters of Tibet from all over Europe. The peaceful manifestation united the voices of Tibetans, which “...makes the Tibet issue stronger”, as was highlighted by Tibetan Prime Minister Lobsang Sangay. Despite the increasing security surveillance in Tibet, Tibetan political leaders are ready to enter into a new phase of peaceful dialogue with Beijing. Read also Phayul.com and a UNPO article published on 10th March 2015. The international community should support Tibet because of the non-violent struggle of its people, Tibetan prime minister-in-exile Lobsang Sangay has said. "It's not an extremist or violent struggle as we see in many parts of the world," Sangay told reporters at the French Parliament on Thursday (12 March 2015). 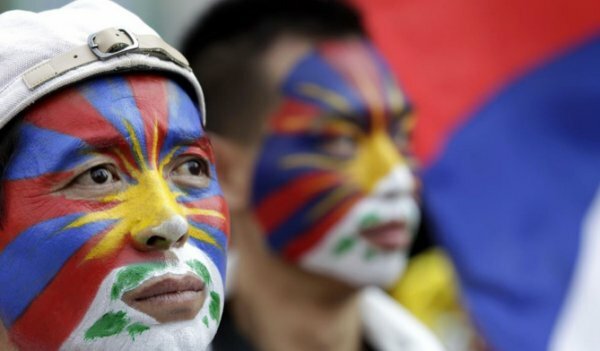 Tibet Group president in the French senate Michel Raison, who was accompanying Sangay, said: "The non-violent struggle of the Tibetan people must be commended and is an example for other struggles to follow." He said the human rights of the Tibetan people were the most important and the Tibet supporters in both -- the French national assembly and senate -- are working together for Tibet. "The French people support us for being involved in the non-violent struggle of the Tibetan people," Raison said. Expressing concern about the large migration of Chinese population into Tibet, Sangay said: "Inside Tibet, nothing has changed... in fact it has gotten worse." About the dialogue with China, the Tibetan political leader said "the envoys of the Dalai Lama are ready to engage in dialogue with their Chinese counterpart at any time and any place".